Heat a tablespoon of oil in a pan and add the refried beans, stirring until hot. Turn off heat and set aside. Using the rest of the oil, fry the tortillas on both sides without toasting them. You only want to warm them up. Drain on paper towels. Immediately pass the tortillas through the beans, only on one side, and transfer them to a plate. Place some shredded chicken on top of each tortilla, and sprinkle with cheese. Fold the tortillas in half or roll them up. Place three stuffed tortillas on each plate. Pour more refried beans on top, and finish off with some onion sauce and shredded cheese. Serve with sliced avocado and cream. Onion sauce: Put the onion in a bowl with water and ice for five minutes. Drain well and mix with the rest of the ingredients. Serve immediately. Add Monterrey Jack or feta cheese. Add jalapeño to the onion sauce. If you want the beans to be spicy, blend them with a chipotle pepper in adobo in a blender. I grew up in a house where beans and tortillas were in constant supply, for lunch and for dinner. For breakfast there was always bread, which we ate with butter and guava jelly. Many times, however, we'd fill the bread with refried beans and make a delicious sandwich that we never could get tired of. Enfrijoladas for dinner are still one of my favorite dishes. They're so easy to make that you don't really need a recipe. Many people compare enfrijoladas to the well-known enchilada, even though the sauce in enfrijoladas is refried beans. 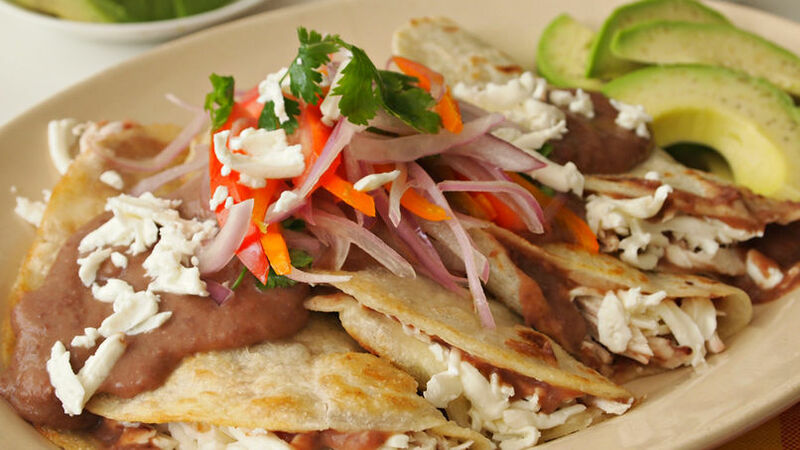 The tortillas, which are lightly fried just to heat them up, are filled with cooked, shredded chicken and Mexican queso fresco. Feel free to use other cheeses, like Monterey Jack or any other cheese you like. Making these delicious enfrijoladas does not require any complicated technique or even a lot of work. Even better if you have ready-made beans. If you have baked or grilled chicken in the fridge, all you have to do is shred it and use it as filling for the tortillas. This way, you'll have a simple, yet delicious dish for any night of the week. Need something else to go with dinner? I'd recommend a simple green salad, as the enfrijoladas are rather filling.